According to Coimisiúin na Logainmneacha (www.logainm.ie), Cloghbrack Upper had two islands called Carrigeenamuck Islands (Carraigín na Muc) and Goat Island (Carraigín na nGabhar). There was also a rock called Carrigeenaskehy (Carraigín na Sceiche) and a minor feature called Leaillaun (An Liathoileán). 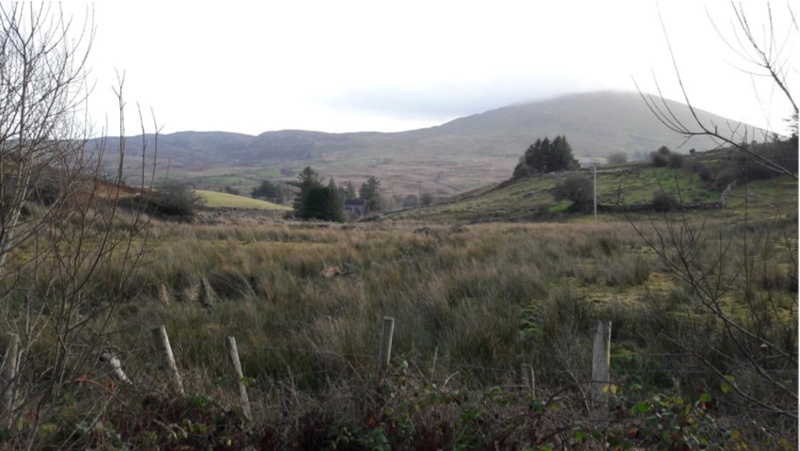 This townland is a central townland bounded on the North by Lough Mask, on the West by Bohaun, on the South by Crimlin East, Tieranee and Ballydoolagh, and on the East by Thoanlegee or Townanal, Shannadullam, Cloghbrack Lower and Cloghbrack Middle. It is in the Barony of Ross in Galway. “The Down Survey was a cadastral survey of Ireland carried out by William Petty, English scientist in 1655 and 1656.The survey was apparently called the “Down Survey” by Petty because the results were set down in maps; ‘admeasurement down’ was used; it is referred to by that name in Petty’s will”. (Wikipedia). In the Down Survey, the name given to Cloghbrack Upper was Cloghbrack alias Gortcoyne. 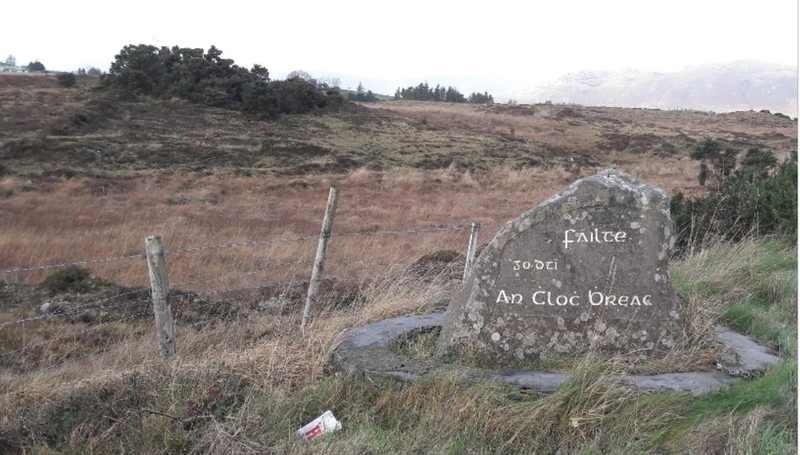 In 1641, the landowner for Cloghbrack Upper was Murrogh McBrien O’Flahartye who was a Catholic and in 1670 the landowner was John Brown who was a Protestant. This townland had 149 plantation acres of unprofitable land and 73 plantation acres of profitable land, 73 plantation acres were forfeited. In 1838, the proprietors for Cloghbrack Upper was the Earl of Leitrim and Charlemont, the agent was Mr. James Fair, Fairhil, Ross Parish. The townland was composed of 1041 acres, 0 roods and 0 perches according to O’ Donovan’s Field name Books (1838). The townland is located in the parish of Ross, in the Barony of Ross and in the County of Galway. O’ Donovan tells us that the townland was under lease by the tenants and the rent was £98.07s.9d. per year. The Co. Cess paid 11 and a quarter d. per acre half yearly. O’ Donovan states that the soil was all mountain heathy mixed and pasturable mountain having spent and arable mountain about the villages crops of oats and potatoes not good this year (transcribed from O Donovan’s Field name Books (1838) found on http://places.galwaylibrary.ie/place/54919). According to Griffith’s Valuation, Cloghbrack Upper had a total acreage of 1041 acres, 0 roods and 0 perches. The annual valuation for the lands in Cloghbrack Upper was £111.9s.0d. Earls of Leitrim and Charlemont were the immediate lessors and they occupied land in plot 14 (-) in this village. Cloghbrack Upper was divided into 16 plots. Plot 1 was composed of 34 acres, 2 perches and 9 roods. This plot was divided into 4 sub-plots (a), (b), (c) and (d). Total annual valuation for this plot was £6.8s.0d. Plot 1 (a) Peter Carney had a house and land. The land was valued at £1.8s.0d. and the house at £0.4s.0d. Plot 1 (b) Anthony Saunders had a house and land. The land was valued at £1.8s.0d. and the house at £0.4s.0d. Plot 1 (c ) Thomas Casey had a house, office and land. The land was valued at £1.8s.0d. and the house at £0.4s.0d. Plot 1 (d) John Saunders had a house, office and land. The land was valued at £1.8s.0d. and the house at £0.4s.0d. Plot 2 was composed of 17 acres, 0 roods and 11 perches. Total annual valuation for this plot was £3.5s.0d. Leckey Halloran had a house, office and land. The land was valued at £2.15s.0d. and the house at £0.10s.0d. Plot 3 was composed of 20 acres, 2 roods and 17 perches. Total annual valuation for this plot was £2.0s.0d. Mark Mulroe had a house, office and land. The land was valued at £1.14s.0d and the house at £0.6s.0d. Plot 4 was composed of 42 acres, 1 rood and 19 perches. This plot was divided into sub-plots (a) and (b). Total annual valuation for this plot was £7.2s.0d. Plot 4 (a) Rodger Comer had a house and land. The land was valued at £3.5s.0d. and the house at £0.6s.0d. Plot 4 (b) Patrick Higgins had a house and land. The land was valued at £3.5s.0d. and the house at £0.6s.0d. Plot 5 was composed of 43 acres, 0 roods and 25 perches. This plot was divided into sub-plots (a), (b) and (c). Total annual valuation for this plot was £9.12s.0d. Plot 5 (a) Patk. Kerrigan, jun. had a house, office and land. The land was valued at £4.5s.0d. and the house at £0.10s.0d. Plot 5 (b) Patrick Kerrigan had a house, office and land. The land was valued at £2.16s.0d. and the house at £0.8s.0d. Plot 5 (c) Matthew Kerrigan had a house and land. The land was valued at £1.8s.0d. and the house at £0.5s.0d. Plot 6 was composed of 30 acres, 1 rood and 13 perches. This plot was divided into (a), (b) and (c). Total annual valuation was £7.10s.0d. Plot 6 (a) Stephen Burke had a house, office and land. The land was valued at £1.12s.0d. and the house at £0.5s.0d. Plot 6 (b) Patrick McNamara had a house, office and land. The land was valued at £2.0s.0d. and the house at £0.5s.0d. Plot 6 (c) Michael McNamara had a house, office and land. The land was valued at £3.2s.0d. and the house at £0.6s.0d. Plot 7 was composed of 27 acres, 3 roods and 6 perches. This plot was divided into 2 sub-plots (a) and (b). Total annual valuation was £7.4s.0d. Plot 7 (a) James Carney had a house, office and land. The land was valued at £4.15s.0d. and the house at £0.7s.0d. Plot 7 (b) Daniel Flynn had a house and land. The land was valued at £1.18s.0d. and the house at £0.4s.0d. Plot 8 was composed of 39 acres, 1 rood and 27 perches. This plot was divided into 4 sub-plots (a), (b), (c) and (d). This plot had a total valuation of £9.2s.0d. Plot 8 (a) Michael Harwood had a house, office and land. The land was valued at £2.14s.0d. and the house at £0.6s.0d. Plot 8 (b) Patrick Connolly had a house and land. The land was valued at £1.6s.0d. and the house at £0.4s.0d. Plot 8 (c) Luke Halloran had a house, office and land. The land was valued at £2.0s.0d and the house at £0.6s.0d. Plot 8 (d) Thaddeus Saunders had a house, office and land. The land was valued at £2.0s.0d and the house at £0.6s.0d. Plot 9 was composed of 38 acres, 2 roods and 12 perches. This plot was divided into 6 sub-plots (a), (b), (c), (d), (e) and (f). Plot 9 had a total valuation of £12.6s.0d. Plot 9 (a) Sarah Higgins had a house and land. The land was valued at £2.4s.0d. and the house at £0.5s.0d. Plot 9 (b) Patrick Mannion had a house and land. The land was valued at £2.4s.0d. and the house at £0.5s.0d. Plot 9 (c) James Cribbin had a house and land. The land was valued at £2.4s.0d. and the house at £0.5s.0d. Plot 9 (d) Anthony Macken had a house and land. The land was valued at £2.4s.0d. and the house at £0.5s.0d. Plot 9 (e) Patrick Higgins had a house and land. The land was valued at £1.2s.0d. and the house at £0.3s.0d. Plot 9 (f) Bridget Sarsfield had a house and land. The land was valued at £1.2s.0d. and the house at £0.3s.0d. Plot 10 was composed of 23 acres, 3 roods and 3 perches. This plot was sub-divided into 2 sub-plots (A) and (-B) and they were both owned by John Halloran. Plot 10 had a total valuation of £6.0s.0d. Plot 10 (A) John Halloran had a house, office and land. The land was valued at £3.15s.0d. and the house at £0.10s.0d. Plot 10 (-B) John Halloran had land. The land was valued at £1.15s.0d. Plot 11 was composed of 14 acres, 0 roods and 24 perches. The plot was divided into 3 sub-plots (A), (-B) and (-C). All three sub-plots belonged to Thomas Walsh. Total valuation for this plot was £2.15s.0d. Plot 11 (A) Thomas Walsh had a house, office and land. The land was valued at £1.10s.0d. and the house at £0.10s.0d. Plot 11 (-B) Thomas Walsh had land valued at £0.7s.0d. Plot 11 (-C) Thomas Walsh had land valued at £0.8s.0d. Plot 12 was composed of 34 acres, 2 roods and 13 perches. The plot was sub-divided into 5 sub-plots (a), (b), (c), (d) and (e). Total valuation for this plot was £9.1s.0d. Plot 12 (a) Thomas Costelloe had a house and land. The land was valued at £1.0s.0d. and the house at £0.5s.0d. Plot 12 (b) John Shaughnessy had a house and land. The land was valued at £1.0s.0d. and the house at £0.5s.0d. Plot 12 (c) John Kerrigan (Mark) had a house and land. The land was valued at £1.0s.0d. and the house at £0.5s.0d. Plot 12 (d) Herbert Costelloe had a house and land. The land was valued at £1.0s.0d. and the house at £0.4s.0d. Plot 12 (e) Pk. Kerrigan (Mark) had a house and land. The land was valued at £3.12s.0d. and the house at £0.10s.0d. Plot 13 was composed of 34 acres, 0 roods and 4 perches. The plot was sub divided into 3 sub-plots (a), (b) and (-). The total valuation of this plot is £7.7s.0d. Plot 13 (a) John Lydon had a house and land. The land was valued at £3.0s.0d. and the house at £0.8s.0d. Plot 13 (b) Patrick Coyne had a house and land. The land was valued at £2.4s.0d. and the house at £0.5s.0d. Plot 13 (-) Patrick Kerrigan had land valued at £1.10s.0d. Plot 14 was composed of 51 acres, 1 rood and 18 perches. The plot was sub-divided into 5 sub-plots (a), (-), (b), (c) and (-). Total valuation for this plot was £6.19s.0d. Plot 14 (a) Michael McGuire had a house, office and land. The land was valued at £2.7s.0d. and the house at £0.7s.0d. Plot 14 (-) Patrick Coyne had land valued at £1.15s.0d. Plot 14 (b) Patrick Lydon had a house, office and land. The land was valued at £1.3s.0d. and the house at £0.4s.0d. Plot 14 (c) Mark Kerrigan had a house and land. The land was valued at £1.3s.0d. and the house at £0.4s.0d. Plot 14 (-) Earls of Leitrim had Charlemont had land valued at £0.16s.0d. Plot 15 was composed of 69 acres, 3 roods and 23 perches. This plot was sub divided into 38 sub-plots. Total valuation for this plot was £10.1s.0d. Plot 15 Sarah Higgins had land valued at £0.6s.0d. Plot 15 Patrick Mannion had land valued at £0.6s.0d. Plot 15 James Cribbin had land valued at £0.6s.0d. Plot 15 Anthony Macken had land valued at £0.5s.0d. Plot 15 Patrick Higgins had land valued at £0.3.0d. Plot 15 Bridget Sarsfield had land valued at £0.3s.0d. Plot 15 John Halloran had land valued at £0.18s.0d. Plot 15 Thomas Walsh had land valued at £0.5s.0d. Plot 15 Thomas Costelloe had land valued at £0.3s.0d. Plot 15 John Shaughnessy had land valued at £0.3s.0d. Plot 15 John Kerrigan (Mark) had land valued at £0.3s.0d. Plot 15 Herbert Costelloe had land valued at £0.3s.0d. Plot 15 Pk. Kerrigan (Mark) had land valued at £0.10s.0d. Plot 15 John Leydon had land valued at £0.8s.0d. Plot 15 Patrick Coyne had land valued at £0.6s.0d. Plot 15 Patrick Kerrigan had land valued at £0.4s.0d. Plot 15 Michael McGuire had land valued at £0.6s.0d. Plot 15 Patrick Lydon had land valued at £0.3s.0d. Plot 15 Mark Kerrigan had land valued at £0.3s.0d. Plot 15 Peter Carney had land valued at £0.3s.0d. Plot 15 Anthony Saunders had land valued at £0.3s.0d. Plot 15 Thomas Casey had land valued at £0.3s.0d. Plot 15 John Saunders had land valued at £0.3s.0d. Plot 15 Leckey Halloran had land valued at £0.5s.0d. Plot 15 Mark Mulroe had land valued at £0.3s.0d. Plot 15 Rodger Comer had land valued at £0.4s.0d. Plot 15 Peter Higgins had land valued at £0.4s.0d. Plot 15 Patk. Kerrigan, jun. had land valued at £0.8s.0d. Plot 15 Patrick Kerrigan had land valued at £0.6s.0d. Plot 15 Matthew Kerrigan had land valued at £0.3s.0d. Plot 15 Stephen Burke had land valued at £0.3s.0d. Plot 15 Patrick McNamara had land valued at £0.3s.0d. Plot 15 Micheal McNamara had land valued at £0.6s.0d. Plot 15 James Carney had land valued at £0.8s.0d. Plot 15 Daniel Flynn had land valued at £0.3s.0d. Plot 15 Micheal Harwood had land valued at £0.6s.0d. Plot 15 Patrick Connelly had land valued at £0.3s.0d. Plot 15 Luke Halloran had land valued at £0.4s.0d. Plot 16 A, B, C was composed of 510 acres, 1 rood and 16 perches of mountain land. This plot was sub-divided into 20 sub plots. Total valuation for this plot was £4.11s.0d. Plot 16 Thaddeus Saunders had land valued at £0.4s.0d. Plot 16 Sarah Higgins had land valued at £0.5s.0d. Plot 16 Patrick Mannion had land valued at £0.5s.0d. Plot 16 James Cribben had land valued at £0.5s.0d. Plot 16 Anthony Macken had land valued at £0.5s.0d. Plot 16 Patrick Higgins had land valued at £0.3s.0d. Plot 16 Bridget Sarsfield had land valued at £0.3s.0d. Plot 16 John Holloran had land valued at £0.12s.0d. Plot 16 Thomas Walsh had land valued at £0.4s.0d. Plot 16 Thomas Costelloe had land valued at £0.3s.0d. Plot 16 John Shaughnessy had land valued at £0.3s.0d. Plot 16 John Kerrigan (Mark) had land valued at £0.3s.0d. Plot 16 Herbert Costelloe had land valued at £0.3s.0d. Plot 16 Pk. Kerrigan (Mark) had land valued at £0.8s.0d. Plot 16 John Lydon had land valued at £0.6s.0d. Plot 16 Patrick Coyne had land valued at £0.5s.0d. Plot 16 Patrick Kerrigan had land valued at £0.3s.0d. Plot 16 Michael McGuire had land valued at £0.5s.0d. Plot 16 Patrick Lydon had land valued at £0.3s.0d. Plot 16 Mark Kerrigan had land valued at £0.3s.0d. The 1901 census indicates there were 58 houses in this village; Everyone in this village was Roman Catholic. Everyone in this village, except for houses 3 and 31,were also born in Galway. Thomas Mannion in house 3 was from England and Honor Herwood in house 31 was from Mayo. According to the Form N. (Enumerator’s abstract for a Townland or Street) there were 58 families in this village with 141 males and 159 females. Form B2 (Return of Out-Offices and Farm-Steadings) are incomplete and for houses 16-29 and 44-58 the out-houses and farm steadings form (Form B2) are not available. Thomas Heggins (60) lived in house numbered 1 with his son, Thomas (15). Thomas (Snr.) was a farmer. Thomas (Snr.) could not read or write but his son could read and write. Both of them spoke Irish and English. They lived in a 3rd class house with two rooms. They had a cow house. Margaret Mackin (60) lived in house numbered 2. Margaret was a farmer. She could not read or write and spoke Irish only. He lived in a 3rd class house with two rooms. They had a cow house. Martin (31) and Honor (28) Mannion lived in house 3 with their four children, their mother, Catherine Mannion (70), and Martin’s nephew, Thomas Mannion (5). Their children were Michael (7), Mary (6), John (4) and Martin (2). Martin (Snr.) was a farmer. Michael and Mary were scholars. Honor and Micheal were the only family members who could read and write, the rest of the household could not. John, Martin (Jnr.) and Catherine spoke Irish only and the rest of the household spoke English and Irish. Thomas was born in England; the rest of the household was born in Galway. They lived in a 3rd class house with two rooms. They had a cow house. Thomas (35) and Bridget (30) Mannion lived in house numbered 4 with their two children, John (10) and Bridget (4). Thomas was a farmer and John was a scholar. No one in this household could read or write. Bridget (Jnr.) spoke Irish only; the rest of the household spoke Irish and English. They lived in a 3rd class house with two rooms. They had a barn. Michael (50) and Bridget (45) Corbett resided in house 5 with their six children. Their children were Mary (15), Bridget (13), Anne (11), John (9), James (7) and Martin (5). Michael was a farmer. Bridget, Anne, John and James were scholars. James and Martin could not read, the rest of the family could read and write. Martin spoke Irish only; the rest of the family spoke Irish and English. They lived in a 2nd class house with three rooms. They had a cow house and a barn. Patrick (60) and Mary (60) Mackin lived in house 6 with their two children, their daughter-in-law, Bridget Mackin (25), and their two grandchildren. Their children were Patrick (30) and Ellen (20) and their grandchildren were Kate (2) and Michael (1). Patrick (Snr.) was a farmer. Patrick, Mary, Kate and Michael could not read, the rest of the household could read and write. Kate and Michael were young to talk, the rest of the household spoke English and Irish. They lived in a 2nd class house with three rooms. They had a cow house, a piggery and a barn. Bridget Kerrigan (65) lived in house 7 with their two children, Bridget (30) and Martin (28). Bridget (Snr.) was a farmer. Bridget (Snr.) could not read but her children could read and write. Bridget (Snr.) spoke Irish only while her children spoke Irish and English. They lived in a 3rd class house with three rooms. They had a cow house, a piggery and a barn. Mary Kerrigan(45) lived in house 8 with their four children and Mary’s brother, Patrick Walsh (50). Mary’s children were Mary (16), Sarah (14), Julia (10) and Martin (7). Mary (Snr.) was a farmer. Julia and Martin were scholars. Mary (Snr. ), Julia and Martin could not read and write, the rest of the family could read or write. Patrick spoke Irish only; the rest of the family spoke Irish and English. They lived in a 3rd class house with two rooms. They had a barn. Michael (50) and Honor (44) Coyne lived in house 9 with their seven children: Thomas (14), Bridget (18), Honor (10), Delia (8), Anne (6), Michael (3) and Catherine (8 months). Michael (Snr.) was a farmer. Bridget, Honor (Jnr.) and Delia were scholars. Thomas, Bridget and Honor (Jnr.) could read and write, the rest of the family could not read or write. Catherine was too young to talk, Michael spoke Irish only and everyone else in the family spoke English and Irish. They lived in a 3rd class house with two rooms. They had a cow house. Mark (50) and Mary (48) Kerrigan resided in house 10 with their three children: Kate (12), Patrick (10) and James (8). Mark was a farmer. Kate, Patrick and James were scholars. Mark and Mary could not read, their children could read and write. Everyone in the family spoke Irish and English. They lived in a 3rd class house with two rooms. They had no Out-Offices or Farm-Steadings. Patrick (60) and Bridget (52) Coyne lived in house numbered 11 with their three children: Catherine (18), Thomas (15) and James (12). Patrick was a farmer. Patrick and Bridget could not read, their children could read and write. The parents spoke Irish only, while their children spoke Irish and English. They lived in a 3rd class house with two rooms. They had a cow house and a piggery. Michael (52) and Mary (50) Shaughnessy lived in house numbered 12 with their four children. Their children were James (17), Thomas (15), Mary (12) and Bridget (2). Michael was a farmer and Mary (Jnr.) was a scholar. The parents and Bridget could not read, the rest of the family could read and write. Mary spoke Irish only. The rest of the family, except Bridget who was too young to talk, spoke Irish and English. They lived in a 3rd class house with two rooms. They had a cow house. Luke (50) and Sarah (45) Coyne resided in house 13 with their eight children. Their children were Mary (20), Kate (19), Michael (17), Bridget (15), Ellen (11), Margaret (9), Patrick (8) and Honor (4). Luke was a farmer. Bridget, Ellen, Margaret and Patrick were scholars. The parents with Patrick and Honor could not read, the rest of the family could read and write. The parents with Honor spoke Irish only; the rest of the household spoke English and Irish. They lived in a 3rd class house with two rooms. They had a cow house. Patrick (60) and Mary (50) Coyne lived in house numbered 14 with their six children. Their children were Bridget (20), Luke (18), Margaret (15), Michael (13), Catherine (11) and James (9). The parents could not read or write and their children could read and write. Patrick spoke Irish only and the rest of the household spoke Irish and English. They lived in a 3rd class house with two rooms. They had a cow house. Honor Shaughnessy(55) resided in house numbered 15. Under the occupation column in the 1901 census she listed ‘No occupation’. She could not read and spoke Irish only. She lived in a 4th class house with one room. She had no Out-Offices or Farm-Steadings. Her landlord was Patrick Coyne who also lived in the village in house 14. Mary Cassidy(58) lived in house 16 with her two children, Mary (36) and Thomas (16). Mary (Snr.) listed under the occupation column in the 1901 census as ‘no occupation’ and she was a widow. Thomas was a labourer. Thomas was the only member of this household who could read and write. The rest of the household could not read or write. Everyone in this household spoke Irish and English. They lived in a 4th class house with one room. The landlord for this household was Thomas Lydon who also lived in the village in house 25. FORM B.2 Return of Out-Offices and Farm- steadings are incomplete for houses 16-29 and 43-58 . John (36) and Mary (34) Kearney lived in house 17 with their three children: Patrick (10), James (4) and Michael (1). John was a labourer and Patrick was a scholar. Patrick was the only person in this household who could read and write, the rest of the family could not. Everyone in this household, except Michael who was too young to talk, spoke English and Irish. They lived in a 3rd class house with two rooms. Their landlord was Patrick Kerrigan. Martin (55) and Catherine (50) Joyce lived in house 18 with their servant, Peter Thornton (16). Martin was a farmer and Peter was a general and domestic servant. Martin and Catherine could not read. Peter could read and write. Martin and Peter spoke Irish and English while Catherine spoke Irish only. They lived in a 3rd class house with two rooms. Hugh McGuire (52) lived in house 19 with their four children : Julia (20), Kate (18), Michael (14) and Honer (11). Hugh was a farmer and Honer was a scholar. Everyone in this household, except Hugh, could read and write. Everyone in this household spoke Irish and English. They lived in a 2nd class house with three rooms. John (42) and Bridget (36) McGuire resided in house 20 with their four children: Mary (11), Kate (8), Honor (5) and Nappy (3). John was a farmer. Mary and Kate were scholars. Mary was the only person in this household who could read and write. Everyone in this household spoke Irish and English. They lived in a 3rd class house with two rooms. Mary McGuire (45) lived in house 21 with her sister, Kate McGuire (42). Mary was a farmer. No one in the family could read or write and they spoke Irish only. They lived in a 3rd class house with two rooms. Patrick (52) and Bridget (50) McGuire lived in house 22 with their daughter, Julia (19). Patrick was a farmer. Julia was the only family member who could read and write. Everyone in this household spoke Irish and English. They lived in a 3rd class house with two rooms. John (45) and Honor (40) Lydon resided in house 23 with their seven children. Their children were John (18), Kate (16), Martin (14), Mary (12), Michael (8), Thomas (6) and Patrick (2). John (Snr.) was a shoemaker. Mary ,Micheal and Thomas were scholars. The parents with Thomas and Patrick could not read, the rest of the household could read and write. John (Snr. ), Honor, Michael and Thomas spoke Irish only, the rest of the household, except Patrick who was too young to talk, spoke Irish and English. They lived in a 3rd class house with two rooms. Kate Lydon (35) lived in house 25 with her sister Margaret Lydon (32). Kate and Margaret both stated their occupation as ‘No occupation’. Both of them could not read and they both spoke Irish only. They lived in a 3rd class house with two rooms. Their landlord was John Lydon. Thomas (55) and Bridget (48) Lydon resided in house 26 with their six children. Their children were Martin (15), Anne (13), Mary (11), Patrick (9), William (8) and James (6). Thomas was a farmer. Anne, Mary, Patrick, William and James were scholars. Anne, Mary and Patrick could read and write, the rest of the family could not. The parents spoke Irish only and the rest of the family spoke Irish and English. They lived in a 3rd class house with two rooms. Bridget Conroy (60) lived in house 26 with her five children: Mary (36), Kate (23), Michael (21), Patrick (19) and William (12). Bridget was a farmer and William was a scholar. Bridget could not read or write, the rest of the family could. Everyone in the family spoke Irish and English. They lived in a 3rd class house with two rooms. Mary Lydon (85) resided in house 27 with her daughter, Mary (50). Mary (Snr.) was a farmer. Both of them could not read and they both spoke Irish only. They lived in a 3rd class house with two rooms. Patrick (28) and Mary (25) Kerrigan lived in house 28 with their two sons. Their sons were Thomas (2) and Patrick (2 months). Patrick (Snr.) was a farmer. The parents could read and write and their children could not. The parents spoke English and Irish and their children were too young to talk. They lived in a 2nd class house with three rooms. Thomas (50) and Bridget (40) Flynn lived in house 29 with their daughter, Mary (2). Thomas was a farmer. No one in this family could read or write. Thomas and Bridget spoke Irish only and Mary was too young to talk. They lived in a 3rd class house with two rooms. Sabina Joyce (50) lived in house 30 with their six children: John (17), Michael (15), Martin (12), Patrick (9), Peter (7) and Walter (4). Sabina was a farmer. Martin, Patrick and Peter were scholars. Sabina and Walter could not read or write, the rest of the family could. Everyone in the family spoke Irish and English. They resided in a 3rd class house with two rooms. They had a cow house and a piggery. Michael (95) and Honor (80) Herwood resided in house 31. Michael was a farmer. Both of them could not read. Michael spoke Irish only while Honor spoke Irish and English. Micheal was born in Galway and Honor was born in Mayo. They lived in a 3rd class house with two rooms. They had no Out-Offices or Farm-Steadings. Ellen Mulroe (50) lived in house 32 with his three children: Thomas (30), Martin (18) and William (15). Ellen was a farmer. Martin was the only person in this household who could read and write. Ellen spoke Irish only while her children spoke Irish and English. They lived in a 2nd class house with three rooms. They had a cow house, a piggery and a barn. Thomas (50) and Mary (47) Mannion lived in house 34 with their eight children and Thomas’ niece, Kate Walsh (11),. Their children were Michael (20), Bridget (14), Margaret (12), Thomas (10), Catherine (8), Honor (5), Barbara (3) and John (6 months). Thomas (Snr.) was a farmer. Bridget, Margaret, Thomas and Catherine were scholars. Michael, Bridget, Margaret, Thomas (Jnr.) and Kate could read and write, the rest of the household could not. John was too young to talk, Mary and Barbara spoke Irish only and the rest of the household spoke Irish and English. They lived in a 2nd class house with three rooms. They had a cow house, a piggery and a barn. John (38) and Kate (38) Kearney occupied house 35 with their seven children: Patrick (13), John (12), Thomas (10), Mary (9), Margaret (7), Catherine (5) and Maggie (2). John (Snr.) was a farmer. John (Jnr. ), Thomas, Mary and Margaret were scholars. Patrick, John (Jnr. ), Thomas and Mary could read and write, the rest of the household could not. Everyone in this household, except Maggie who was too young to talk, spoke Irish and English. They lived in a 3rd class house with two rooms. They had a piggery. Mary Kearney (60) lived in house 36. Mary listed her occupation as ‘No occupation’. She could not read or write and she spoke Irish only. She lived in a 4th class house with one room. She had no Out-Offices or Farm-Steadings. Her landlord was John Kearney who also lived in the village in house 35. William (58) and Sarah (54) Kearney resided in house 37 with their four children: William (18), Martin (13), Denis (11) and Kate (9). William (Snr.) was a farmer. Denis and Kate were scholars. The parents could not read but their children could. Everyone in this house spoke English and Irish. They lived in a 2nd class house with three rooms. They had a piggery and a barn. Michael (40) and Margaret (38) Coyne lived in house numbered 38 with their three children and Michael’s mother in law, Bridget Coyne (70), Their children were Bridget (6), Mary (4) and Ellen (1 month). Michael was a farmer. No one in this household could read or write. Ellen was too young to talk. Mary and Bridget spoke Irish only. Michael, Margaret and Bridget spoke Irish and English. They resided in a 3rd class house with two rooms. They had a cow house and a barn. Denis (40) and Julia (40) Carney resided in house numbered 39 with their three daughters. Their daughters were Mary (6), Anne (3) and Bridget (1). Denis was a labourer and Mary was a scholar. Julia was the only person in this household who could read and write. Bridget was too young to talk. Anne spoke Irish only and the rest of the household spoke Irish and English. They lived in a 3rd class house with two rooms. They had no Out-Offices or Farm-Steadings. Their landlord was Michael Carney who also lived in this village in house 54. Michael (58) and Mary (55) Burke lived in house numbered 40 with their three children. Their children were Kate (18), Mary (14) and Anne (11). Michael was a farmer. The parents and Anne could not read or write, the rest of the household could. Everyone in this household spoke Irish and English. They resided in a 3rd class house with two rooms. They had a cow house. John Lydon (52) resided in house numbered 41 with their five children. Their children were Martin (17), Kate (14), Michael (10), Bridget (7) and Thomas (5). John was a farmer. Michael and Bridget were scholars. John, Bridget and Thomas could not read or write, the rest of the household could. John, Bridget and Thomas spoke Irish only, the rest of the household spoke Irish and English. They lived in a 3rd class house with two rooms. They had a cow house and a piggery. Martin (45) and Sarah (40) Kerrigan resided in house numbered 42 with their three children: Patrick (11), Mary (6) and John (3). Martin was a farmer and Patrick was a scholar. Patrick was the only person in this household who could read and write, the rest of the household could not. Everyone in this household, except John who spoke Irish only, spoke English and Irish. They lived in a 2nd class house with three rooms. They had a barn. Mary Kerrigan(50) lived in house numbered 43 with her three children: Kate (15), Patrick(10) and Martin(4). Mary was a farmer and Patrick was a scholar. Mary and Martin could not read, the rest of the household could read and write. Mary and Martin spoke Irish only; the rest of the household spoke Irish and English. They lived in a 3rdclass house with two rooms. They had a barn. According to information from desendants of this family, Mary Kerrigan’s two daughters and son also lived in this village in house numbered 56. These children were Bridget, Margaret and Thomas Kerrigan. Mary McNamara (80) lived in house 44. Mary listed her occupation as ‘No Occupation’. She could not read or write and spoke Irish only. She lived in a 3rd class house with one room. FORM B.2 Return of Out-Offices and Farm- steadings are incomplete for houses 16-29 and 44-58. Her landlord was Michael Mulroe who also lived in Cloghbrack Upper in house 47. Martin (40) and Margaret (38) Higgins resided in house numbered 45 with their seven children. Their children were Peter (11), Patrick (10), Mary (9), Kate (6), Ellen (5), John (3) and Michael (9 months). Martin was a farmer. Peter, Patrick, Mary and Kate were scholars. Peter, Patrick and Mary were the only members of this household who could read and write. Ellen and John spoke Irish only and the rest of the household, except Michael who was too young to talk, spoke Irish and English. They lived in a 2nd class house with three rooms. Patrick (45) and Mary (30) Higgins lived in house numbered 46 with their seven children. Their seven children were Martin (16), Bridget (14), Ellen (11), Catherine (8), Michael (4), Honor (2) and Margaret (3 months). Patrick was a farmer. Ellen and Catherine were scholars. Martin, Bridget and Ellen could read and write, the rest of the household could not. Honor and Margaret were too young to talk, Michael spoke Irish only and the rest of the household spoke Irish and English. They resided in a 3rd class house with two rooms. Michael (50) and Mary (49) Mulroe resided in house that was numbered 47 with their seven children. Their children were Mary (18), Patrick (16), Martin (14), James (12), Anne (10), Bridget (7) and Ellen (5). Michael was a farmer. James, Anne and Bridget were scholars. The parents with Bridget and Ellen could not read, the rest of the family could read and write. Everyone in this household spoke English and Irish. They lived in a 2nd class house with three rooms. John Halloran (61) lived in house numbered 48 with their three children. On the night of the census they had a visitor, Ellen Laffy (4). Their children were Malakey (sic.) (23), Catherine (21) and Nappy (sic.) (18). John was a farmer. Malakey was a wool weaver. Nappy was a dressmaker. Ellen could not read or write, the rest of the household could. Ellen spoke English only, while the rest of the household spoke English and Irish. They lived in a 2nd class house with three rooms. Patrick (50) and Bridget (43) Casey lived in house numbered 49 with their five children: Micheal (20), Patrick (10), Peter (9), William (6) and Mary (4). Patrick (Snr.) was a farmer. Patrick (Jnr. ), Peter and William were scholars. The parents with William and Mary could not read or write, the rest of the family could. Everyone in this family, except Mary who spoke Irish only, spoke Irish and English. They lived in a 3rd class house with two rooms. Martin (36) and Margaret (36) Carney lived in house 50 with their three children and Martin’s mother, Bridget Carney (78). Their children were Michael (12), Mary (9) and Bridget (5). Martin was a farmer and tailor. Michael and Mary were scholars. Michael was the only member of this household who could read and write. Michael and Mary spoke English and Irish, the rest of the household spoke Irish only. They lived in a 3rd class house with two rooms. Patrick (60) and Margaret (50) Kerrigan resided in house 51 with their four children; Bridget (16), Honor (11), Martin (8) and Ellen (5). Patrick was a farmer. Honor and Martin were scholars. Bridget and Honor could read and write, while the rest of the family could not. Everyone in this family spoke Irish and English. They lived in a 3rd class house with two rooms. John (70) and Catherine (60) Kerrigan lived in house numbered 52 with their two children, John (23) and Thomas (18). John (Snr.) was a farmer. The parents could not read but their children could read and write. John (Snr.) spoke Irish only and the rest of the household spoke Irish and English. They lived in a 3rd class house with two rooms. Patrick (45) and Bridget (40) Burke resided in house numbered 53 with their six children. Their children were Patrick (14), Mary (12), Bridget (10), Michael (8), Julia (4) and Kate (4). Patrick (Snr.) was a farmer. Mary, Bridget (Jnr. ), Michael were scholars. The parents with Julia and Kate could not read or write, the rest of the household could. Patrick (Snr. ), Julia and Kate spoke Irish only, the rest of the household spoke Irish and English. They resided in a 3rd class house with two rooms. Michael (63) and Mary (60) Carney lived in house numbered 54 with their two daughters; Margaret (24) and Mary (20). Michael was a farmer. Mary (Jnr.) was the only member of this household who could read and write. The parents spoke Irish only and their children spoke Irish and English. They lived in a 2nd class house with three rooms. Anthony Saunders (75) resided in house numbered 55 with his son, daughter in law and his four grandchildren. His son was John (36). His daughter in law was Bridget Saunders (32). His grandchildren were Thomas (7), Mary (4), John (3) and Martin (1). Anthony was a farmer and Thomas was a scholar. No one in this family could read or write. Martin was too young to talk. Anthony, Mary and John (Jnr. )spoke Irish only. The rest of the household spoke Irish and English. They resided in a 3rd class house with two rooms. Bridget Kerrigan (20) lived in house numbered 56 with her sister and brother. Her sister was Margaret(11) and her brother was Thomas(8). Bridget was a farmer. Margaret and Thomas were scholars. No one in this household could read or write and they all spoke Irish and English. They lived in a 3rdclass house with two rooms. According to descendants of this family, the mother of these occupants, Mary Kerrigan, also lived in this village in house numbered 43. Michael (60) and Honor (58) Morrin resided in house numbered 57 with their servant, John Coyne (13). Micheal was a farmer and John was a general and domestic servant. Micheal and Honor could not read or write while John could read and write. Honor spoke Irish only. Michael and John spoke Irish and English. They lived in a 3rd class house with two rooms. Catherine Higgins (45) lived in house numbered 58 with her son, John (17). Catherine was a farmer. John was the only member of this household who could read and write. Catherine spoke Irish only while her son spoke Irish and English. They lived in a 3rd class house with two rooms. Ten years later the census questions were expanded to include the following: Particulars as to Marriage (which included – completed years the present marriage has lasted, children born alive to present marriage, total children born alive to this marriage, and children still living); if Deaf and Dumb, Dumb only, Blind, Imbecile or Idiot, Lunatic. In the previous census they were 58 occupied houses and in this census 54 houses are listed. House numbered 5 Form A-Household Return was not collected. In this 1911 census there is no mention of three of the Kerrigan households, one of the Shaughnessey households, the Cassidy household, one of the McGuire households, one of the Kearney households and one of the Lydon households. There was also three new households, these households were Kerrigan in house 8, Halloran in house 9 and Joyce in house 53. All those enumerated here were Roman Catholic. Everyone in this village, except for 3 houses whose occupants was born outside of Galway, was born in Galway. These houses were houses numbered 14,18, and 54. For houses 6,8,21 and 49 the birthplace of some of their occupants is not stated, therefore unsure where they were born. House numbers differ from those of 1901. There are also inconsistent age gaps between 1901 to 1911 census. The Out-Offices and Farm-Steadings Return (Form B2) were incomplete for some houses in 1901 so unable to compare them for the 1911 houses. Tom (called Thomas in 1901) (50) and Bridget (55) Mannion lived in house numbered 1 (previously numbered house 4 in 1901) with their three children: John (13), Bridget (19) and Tommy (14). Tom and Bridget (Snr.) had been married for 24 years, had six children and three of them had survived by 1911. Tom was a farmer. John and Tommy were scholars. The parents could not read or write but their children could. Tommy spoke Irish only and the rest of the household spoke Irish and English. They still lived in a 3rd class house with two rooms. They added a stable and a cow house by 1911 but no longer had a barn. Tom (called Thomas in 1901)(73) and Mary (55) Higgins (called Heggins in 1901)lived in house 2 (previously numbered house 1 in 1901). There was no mention of Thomas (Jnr.) in this 1911 census. Tom and Mary had been married for 6 years and had no children together. Tom was a farmer. Tom and Mary could not read or write. Tom spoke Irish and English, while Mary spoke Irish only. They still lived in a 3rd class house with two rooms. They still had a cow house. Martin (55) and Mary (56) Mannion lived in house 3 (same numbered house in 1901) with their five children. Their children were Michael (14), John (13), Martin (10), Patrick (5) and Kate (1). There was no mention of Honor, Mary, Catherine or Thomas in this 1911 census. Martin and Mary had been married for 6 years, had two children and both had lived by 1911. Martin was a farmer. John, Martin and Patrick were scholars. Michael and John could read and write. Martin could read only and the rest of the household could not read or write. Martin, Mary and Michael spoke Irish and English. John, Martin and Patrick spoke Irish only. Kate was too young to talk. They still lived in a 3rd class house with two rooms. They still had a cow house. Kate (called Catherine in 1901) Higgins (58) resided in house 4 (previously numbered house 58). There was no mention of John in this 1901 census. Kate was a widow and did not give details of her previous marriage. Kate was a farmer. She could not read and spoke Irish only. She still lived in a 3rd class house with two rooms. She had a cow house. Maggie Mackin was the head of the household of house 5 (previously numbered 2 in 1901) according to Form B1- House and Building Return. Also according to Form B1, the Form A-Household Return was not collected. Form B1 also informs us that that there was only one occupant in this household. This house was a 2nd class house with three rooms. They had a stable and a cow house. Michael (70) and Bridget (58) Corbett lived in house 6 (previously numbered 5 in 1901) with their five children. Their five children were Bridget (22), Ellin (20), John (19), James (17) and Martin (14). There was no mention of Mary or Anne in this 1911 census. Michael and Bridget (Snr.) were married for 28 years, had 6 children and all of them had lived until 1911. Michael was a farmer. The parents could not read or write but their children could. Martin’s column for the Irish language was not filled therefore unsure what languages he spoke. Bridget (Snr.) spoke Irish only and the rest of the household spoke Irish and English. It is not listed on the census form where Martin was born, everyone else in this household was born in Galway. They still lived in a 2nd class house with two rooms. They still had a cow house. Pat (called Patrick in 1901) (76) and Mary (78) Macken resided in house 7 (previously numbered house 6 in 1901) with their son, daughter-in-law and their eight grandchildren. Their son was Pat (called Patrick in 1901) (40). Their daughter-in-law was Bridget (36). Their grandchildren were Kate (14), Michael (11), Anthony (7), Mary (6), Bridget (5), Ellin (3), Pat (4) and John (9). There was no mention of Ellen in this 1911 census. Pat (76) and Mary (78) were married for 40 years, had 8 children and 5 of them had survived by 1911. Pat (40) and Bridget (36) had been married for 15 years, had 9 children and 8 of them had survived by 1911. Pat (76) was a farmer. Kate, Michael, Anthony, Mary (6), Bridget (5), Pat (4) and John were scholars. Kate, Michael and John could read and write. Anthony and Mary (6) could read only. The rest of the household could not read or write. Mary (78), Mary (6), Bridget (5), Ellin and Pat (4) spoke Irish only; the rest of the household spoke Irish and English. They lived in a 2nd class house with 2 rooms in 1911; in 1901 they lived in a 2nd class house with three rooms. They had a cow house and calf house but no longer had a piggery or barn. Mary Kerrigan (50) resided in house numbered 8 with her four children; Michael (8), Martin (7), John (4) and Mary (2). This was a new household in Cloghbrack Upper. Mary (Snr.) was married for 11 years, had five children and five of them had survived until 1911. Mary (Snr.) was a farmer. Michael, Martin and John were scholars. Michael was the only person in this household who could read only, the rest of the household could not read or write. Mary (Snr.) and Michael spoke Irish and English, Martin spoke Irish only. Mary (Snr.) was born in Mayo. Michael, Martin and John were born in Galway. Unsure where Mary (Jnr.) was born as not stated where she was born on census form. They lived in a 2nd class house with three rooms. They had a cow house. Tom (50) and Kate (34) Halloran lived in house 9 with their four children; Pat (6), Tom (5), Michael (2) and Mary (1). This was a new household in Cloghbrack Upper. Tom (Snr.) and Kate had been married for 7 years, had six children and five of them had survived until 1911. Tom (Snr.) was a farmer. Pat and Tom were scholars. Kate and Pat could read only, the rest of the household could not read or write. The parents spoke Irish and English. Their children, except Mary who was too young to talk, spoke Irish only. They lived in a 2nd class house with two rooms. They had a stable and a cow house. Mary Kerrigan (60) lived in house 10 (previously numbered house 8) with her son, Martin (19), and a boarder, Pat Walsh (64). There was no mention of Mary, Sarah, Julia or Patrick Walsh, in this 1911 census. Mary was a widow and did not give details of her previous marriage. Mary was a farmer and Pat was a farm servant. Martin was the only person in this household who could read and write. Mary and Martin spoke Irish and English. Pat spoke Irish only. They still lived in a 3rd class house with two rooms. They had a cow house but no longer had a barn. Mark (60) and Mary (61) Kerrigan lived in house 11 (previously numbered house 10) with their two children Kate (21) and Mark (15). There was no mention of Patrick or James in this 1911 census. Mark (Snr.) and Mary were married for 30 years, had six children and six of them had survived by 1911. Mark (Snr.) was a farmer. The parents could not read but their children could. Mary spoke Irish only and the rest of the household spoke Irish and English. They still lived in a 3rd class house with two rooms. They still had a cow house but longer had a piggery. Michael (60) and Nora (called Honor in 1901) (57) Coyne lived in house 12 (previously numbered house 9) with their five children. Their five children were Tom (called Thomas in 1901), (27), Nora (called Honor in 1901) (18), Anne (16), Michael (12) and Kate (called Catherine in 1901) (10). There was no mention of Bridget or Delia in this 1911 census. Michael and Nora were married for 29 years, had eight children and all eight of them had survived by 1911. Michael was a farmer. Tom was a shoe maker. Anne, Michael and Kate were scholars. The parents could not read or write but their children could. Everyone in this household, except Kate who spoke Irish only, spoke Irish and English. They still lived in a 2nd class house but had three rooms instead of two rooms they had in 1901. They still had a cow house. Michael (70) and Mary (69) Shoughnessey lived in house 13 (previously numbered house 12) with their two children. Their children were Jem (called James in 1901) (27) and Bridget (12). There was no mention of Thomas or Mary in this 1911 census. Michael and Mary were married for 35 years, had five children and five of them had survived by 1911. Michael was a farmer and Bridget was a scholar. The parents could not read or write. Jem could read only and Bridget could read and write. Everyone in this family, except Jem who spoke Irish and English, spoke Irish only. They lived in a 2nd class house with 3 rooms in 1911. In 1901 they lived in a 3rd class house with two rooms. They still had a cow house. Pat (called Patrick in 1901) (72) and Bridget (70) Coyne lived in house 14 (previously numbered house 11) with their two children, their daughter-in-law and their three grandchildren. Their children were Pat Coyne (30) and Kate Stranger (called Catherine Coyne in 1901) (27). Their daughter-in-law was Kate Coyne (27). Their grandchildren were Tom Coyne (1), Francis S. Stranger (3) and Clements Ed. Stranger (2). There was no mention of Thomas or James Coyne in this 1911 census. Pat (Snr.) and Bridget had been married for 40 years, had eleven children and seven of them had survived by 1911. Kate and Pat Coyne were married for two years, had one children that survived by 1911. Kate Stranger had been married for four years, had two children, which both survived by 1911. Her husband is not mentioned in this census. Pat (Snr.) was a farmer. The grandparents and grandchildren could not read or write, the rest of the household could read and write. The grandparents spoke Irish only, the other adults spoke Irish and English and the grandchildren were too young to talk. Everyone in this household, except Francis S. and Clements Ed., was born in Galway. Francis S. and Clements Ed. were born in America. They lived in a 2nd class house with 2 rooms in 1911; they did live in a 3rd class house with two rooms in 1901. They still had a cow house and added a calf house but no longer had a piggery by 1911. Mary Coyne (70) lived in house 15 (previously numbered 14 in 1901) with her three children; Luke (30), Kate (called Catherine in 1901) (22) and James (20). There was no mention of Patrick, Bridget, Margaret or Michael in this 1911 census. Mary was a widow and did not give details of her previous marriage. Mary was a farmer. Mary could not read or write, James could read only and the rest of the family could read and write. Mary spoke Irish only and the rest of the family spoke Irish and English. They still lived in a 3rd class house with two rooms. They still had a cow house. Luke (69) and Sarah (65) Coyne lived in house 16 (previously numbered 13 in 1901) with their four children Ellen (20), Pat (called Patrick in 1901) (21), Maggie (called Margaret in 1901) (18) and Nora (called Honor in 1901) (16). There was no mention of Mary, Kate, Michael or Kate in this census. Luke and Sarah were married for 30 years, had eight children and six of them had survived by 1911. Luke was a farmer. The parents with Maggie and Nora could not read or write. Ellen could read only. Pat could read and write. Luke, Pat and Maggie spoke Irish and English, the rest of the household spoke Irish only. They still lived in a 3rd class house with two rooms. They had a cow house. Mary McNamara (84) resided in house 17 (previously numbered 44 in 1901). Mary was a widow and did not give details of her previous marriage. Her occupation was listed as ‘Old age pensioner’. She could not read or write and spoke Irish only. She still lived in a 3rd class house with one room. She no out offices or farm steadings. Her landlord was Michael Mulroe who also resided in Cloghbrack Upper in house 48. John (56) and Nora (called Honor in 1901) (43) Lydon resided in house 18 (previously numbered 23 in 1901) with their four children. They also had a boarder living with them, Mary Cassidy (69). Their four children were Michael (19), Tom (called Thomas in 1901) (17), Pat (called Patrick in 1901) (12) and Anthony (8). There was no mention of John, Kate, Martin or Mary in this 1911 census. John and Nora were married for 29 years, had four children and four of them were still living by 1911. John was a farmer. John, Nora, Michael and Mary could not read or write. Tom could read only. The rest of the household could read and write. Micheal was the only person in this household who spoke Irish and English, the rest of the household spoke Irish only. They lived in a 2nd class house with two rooms in 1911; in 1901 they lived in a 3rd class house with two rooms. They had a cow house. Martin (73) and Catherine (69) Joyce lived in house numbered 20 (previously numbered 18 in 1901). There was no mention of Peter Thornton in this 1911 census. Martin and Catherine had been married for 32 years and had no children. Martin was a farmer. No one in this family could read or write. Martin spoke Irish and English. Catherine spoke Irish only. They still lived in a 3rd class house with two rooms. They had a cow house. Thomas (64) and Mary (65) Mannion lived in house 22 in 1911 (was numbered house 34 in 1911) with their four children. Their four children were Tom (called Thomas in 1901) (20), Kate (called Catherine in 1901) (18), Nora (called Honor in 1901) (15) and John (10). There was no mention of Michael, Bridget, Margaret, Barbara or Kate in this 1911 census. Thomas and Mary were married for 38 years, had 9 children and 8 of them had survived until 1911. Thomas was a farmer. The parents could not read or write, their children could read and write. Mary spoke Irish only; the rest of the household spoke English and Irish. They lived in a 2nd class house with two rooms in 1901; in 1911 they lived in a 2nd class house with two rooms in 1911. They had a cow house. William (67) and Sarah (70) Carney resided in house 23 in 1911 (previously numbered 37 in 1901) with their son, Denis (22). There was no mention of William, Martin or Kate in this 1911 census. William and Sarah were married for 40 years, had eleven children and seven of them had survived by 1911. William was a farmer. The parents could not read or write. Denis could read and write. The parents spoke Irish only. Denis spoke Irish and English. They lived in a 2nd class house with three rooms. They had a cow house. John (50) and Kate (50) Carney (surname was called Kearney in 1901) lived in house numbered 24 (was numbered 35 in 1901) with their eight children. Their children were John (23), Tom (was called Thomas in 1901) (22), Michael (7), Mary (20), Maria (was called Margaret in 1901) (18), Kate (was called Catherine in 1901) (15), Maggie (12) and Bridget (10). There was no mention of Patrick in this 1911 census. John (Snr.) and Kate (Snr.) were married for 26 years, had ten children and eight of them had survived by 1911. John (Snr.) was a farmer. Michael, Maggie and Bridget were scholars. The parents could not read or write but their children could. Kate (Snr.) and Bridget spoke Irish only, the rest of the household spoke Irish and English. They still lived in a 3rd class house with two rooms. They had a cow house but no longer had a piggery. Sabina Joyce (65) lived in house numbered 25 (previously numbered house 30) with her three sons. Her three sons were Pat (was called Patrick in 1901) (20), Peter (18), Walter (16). No mention of John, Michael and Martin in this 1911 census. Sabina was a widow and did not give details of her previous marriage. Sabina was a farmer and Walter was a scholar. Sabina could not read or write but her children could. Everyone in this household spoke Irish and English. They still lived in a 3rd class house with two rooms. They had a cow house. Michael (73) and Nora (called Honor in 1901) (72) Morrin resided in house numbered 26 (previously numbered house 57). There was no mention of John in this census. Micheal and Nora had been married for 50 years, had five children and all five of them had lived by 1911. Michael was a farmer. No one in this household could read or write. Micheal spoke Irish and English and Nora spoke Irish only. They still lived in a 3rd class house with two rooms. They had a cow house. Tom (called Thomas in 1901) (47) and Bridget (35) Mullroe lived in house 27 (previously numbered house 32) with their three children, a boarder and Tom’s sister. Their children were Martin (6), Pat (4) and Willie (1). Their boarder was Ellen Mullroe (73) and Tom’s sister was Mary Mullroe (36). There is no mention of Martin or William in this census. Tom and Bridget had been married for 7 years, had three children and all three of them had survived by 1911. Tom was a farmer, Martin and Pat were scholars, Ellen was listed as an ‘old age pensioner’ and Mary was a dressmaker. Tom, Ellen and Willie could not read or write, Martin and Pat could read only and everyone else in this household could read and write. Tom, Bridget and Mary spoke Irish and English, Martin, Pat and Ellen spoke Irish only and Willie was too young to talk. They still lived in a 2nd class house with three rooms. They had a cow house and added a calf house but no longer had a piggery and a barn. Micheal (50) and Julia (30) Coyne resided in house numbered 28 ( previously numbered house 38) with their seven children; Mary (17), Ellin (15), Bridget (13), John (6), Nora (4), Sarah (1) and Maggie (2). There was no mention of Margaret or her mother Bridget in this census. Michael and Julia were married for 7 years, had four children with Julia and all four of them had survived by 1911. Michael was a farmer and Bridget, John and Nora were scholars. Michael, Nora, Sarah and Maggie could not read or write. John could read only. The rest of the household could read and write. Michael, Julia, Mary, Ellen and Bridget spoke Irish and English. Sarah and Maggie were too young to talk; the rest of the household spoke Irish only. They still lived in a 3rd class house with two rooms. They still had a cow house but no longer had a barn. Michael (73) and Mary (73) Carney lived in house numbered 29 (previously numbered house 54). There was no mention of Margaret or Mary in this census. Micheal and Mary had been married for 34 years, had 8 children and 7 of them had lived until 1911. Micheal was a farmer. Both of them could not read and they both spoke Irish only. They lived in a 3rd class house with 2 rooms in 1911; in 1901 they lived in a 2nd class house with 3 rooms. They had a cow house and a calf house. Denis (48) and Julia (42) Carney resided in house numbered 30 (previously numbered house 39) with their seven children; Mary (17), Annie (called Anne in the 1901 census) (14), Bridget (12), Maggie (10), Pat (6), Kate (3) and Michael (1). Denis and Julia were married for 20 years, had 10 children and 7 of them had survived until 1911. Denis was a farmer. Annie, Bridget, Maggie and Pat were scholars. Denis, Kate and Michael could not read or write, Pat could read and everyone else in this household could read and write. Maggie, Pat and Kate spoke Irish only. Michael was too young to talk and everyone else spoke Irish and English. They still lived in a 3rd class house with 2 rooms. They added a cow house and a calf house. Kate (called Catherine in 1901) (72) Halloran lived in house numbered 31 (previously numbered house 33). There was no mention of Thomas in this 1911 census. Kate was a widow and did not give details of her previous marriage. Kate was listed as an ‘Old age pensioner’. She could not read and spoke Irish only. She lived in a 4th class house with 1 room in 1911; in 1901 she lived in a 3rd class house with two rooms. In 1911 Kate had no out offices or farm steadings, in 1901 she had a cow house and a piggery. The landlord for this house was Tom Halloran who also lived in this village in house 31. John (75) Halloran resided in house 32 (was numbered 48 in the 1901 census) with his son, his daughter-in-law and his two grandsons. His son was Mallachey (was called Malakey in the 1901 census) (36), his daughter in law was Mary Halloran (30); his grandsons were Thomas (2) and John (1). There is no mention of Catherine Halloran, Nappy Halloran or Ellen Laffy in this 1901 census. John was a widower and did not give details of his previous marriage. Mallachey and Mary were married for 3 years, had two children and both of them had survived until 1911. John was a farmer. John, Mallachey (sic.) and Mary could read and write and spoke Irish and English, the rest of the household were too young to read or talk. They still lived in a 2nd class house with 3 rooms. They had a stable, a cow house and a calf house. Michael (71) and Mary (65) Burke resided in house numbered 33 (previously numbered house 40) with their daughter, Anne (17). There was no mention of Kate or Mary (Jnr.) in this 1911 census. Michael and Mary were married for 30 years, had four children and all four of them had survived until 1911. Michael was a farmer. Anne was the only person in this household who could read and write. Michael spoke Irish and English and the rest of the household spoke Irish only. They still lived in a 3rd class house with 2 rooms. They still had a cow house and added a calf house. John Lydon (65) lived in house 34 (previously numbered house 41) with their three children; Michael (20), Bridget (15) and Thomas (10). There was no mention of Martin or Kate in this 1911 census. John was a widower and did not give details of her previous marriage. John was a farmer. John could not read or write, the rest of the household could read and write. John spoke Irish only and the rest of the household spoke Irish and English. They still lived in a 3rd class house with 2 rooms. They still had a cow house but no longer had a piggery. Tom (called Thomas in 1901) (66) and Bridget (37) Flynn resided in house numbered 35 (previously numbered house 29) with their two children; John (8) and Mary (12). Tom and Bridget were married for 13 years, had two children and both of them had survived until 1911. Tom was a farmer. John and Mary were scholars. The parents could not read or write but their children could read. Everyone in this household spoke Irish only. They lived in a 3rd class house with 1 room in 1911; in 1901 they lived in a 3rd class house with 2 rooms. They had a cow house. Pat (was called Patrick in 1901) (38) and Mary (36) Kerrigan lived in house numbered 36 (previously numbered house 28) with their four children; Tom (called Thomas in 1901) (12), Pat (called Patrick in 1901) (10), John (8) and Mary (3). Pat (Snr.) and Mary (Snr.) were married for 13 years, had six children and four of them survived until 1911. Pat (Snr.) was a farmer. Tom, Pat (Jnr.) and John were scholars. Pat (Snr. ), Mary (Snr.) and Tom could read and write. Pat (Jnr.) and John could read only and Mary (Jnr.) was too young to talk. Pat (Snr. ), Mary (Snr.) and Tom spoke Irish and English. Pat (Jnr.) and John spoke Irish only. Mary was too young to talk. They still lived in a 2nd class house with 3 rooms. They had a cow house. Mary Lydon (50) lived in house 37 (previously numbered house 27). There was no mention of Mary (Snr.) in this 1911 census. Mary was unmarried and was a farmer. She could not read and spoke Irish only. She still lived in a 3rd class house with two rooms. She had a cow house. Pat (called Patrick in 1901) (27) and Mary (28) Conroy resided in house 38 (previously numbered 26 in 1901) with their three children; Michael (5), Bridget (4), John (2). There was no mention of Bridget, Mary, Kate, Michael or William in this census. Pat and Mary had been married for 10 years, had three children and three of them had survived by 1911. Pat was a farmer. Mary was the only person in this household who could read and write, the rest of the household could not. The parents spoke Irish and English and the children spoke Irish only. They still lived in a 3rd class house with two rooms. They had a cow house. John (50) and Bridget (46) McGuire lived in house 39 (previously numbered house 20) with their six children; Pat (10), John (6), Martin (3), Kate (9), Nora (15), Naapy (was called Nappy in 1901) (12). There was no mention of Mary in this census. John (Snr.) and Bridget had been married for 20 years, had six children and all six of them had survived until 1911. John (Snr.) was a farmer. John and Kate were scholars. John (Snr. ), Bridget and Martin could not read or write. John could read and the rest of the household could read and write. They still lived in a 3rd class house with 2 rooms. They had a cow house. Mary McGuire (60) resided in house 40 (previously numbered house 21) with her sister, Kate McGuire (50). They were both farmers. Both of them could not read or write and they both spoke Irish only. They still lived in a 3rd class house with 2 rooms. They had a cow house. Hugh McGuire (63) lived in house 41 (previously numbered house 19) with his son, Michael Michael (as per transcribed from Form A in the 1911 census for house 41) (26), and Hugh’s grandchild, Bridget McDonagh (9). There was no mention of Julia, Kate or Honor in this 1911 census. Hugh was a widower and does not give details of his previous marriage. Hugh was a farmer and Bridget was a scholar. Hugh and Michael could not read but Bridget could read and write. Everyone in this household spoke Irish and English. They lived in a 3rd class house with 2 rooms in 1911; in 1901 they lived in a 2nd class house with 3 rooms. They had a cow house. Pat (called Patrick in 1901) (69) and Bridget (81) McGuire occupied house 42 (previously numbered house 22). There was no mention of Julia in this 1911 census. Pat and Bridget have been married for 45 years, had nine children and seven of them had survived until 1911. Pat was a farmer. Both of them could not read or write. Pat spoke Irish only and Bridget spoke Irish and English. They still lived in a 3rd class house with 2 rooms. They had a cow house. Martin (57) and Sarah (52) Kerrigan occupied house 43 (previously numbered house 42) with their two children, Mary (14) and John (11). There was no mention of Patrick in this 1911 census. Martin and Sarah had been married for 23 years, had five children and three of them had survived until 1911. Martin was a farmer and John was a scholar. The parents could not read but their children could read and write. Sarah spoke Irish only; the rest of the household spoke Irish and English. They lived in a 3rd class house with 2 rooms in 1911; in 1901 they lived in a 2nd class house with 3 rooms. They added a cow house but no longer had a barn. Mary Kerrigan (58) resided in house 44(previously numbered house 43) with their three sons; Pat(20), Tom(16) and Martin(14). There was no mention of Kate in this 1911 census. According to information from descendants of this family, Kate was not mentioned in this 1911 census because she immigrated to Pittsburgh, PA. Mary was a widow and did not give details of her previous marriage. Mary was a farmer. Mary could not read, Pat could read and Tom and Martin could read or write. Mary spoke Irish only; the rest of the household spoke Irish and English. They lived in a 3rdclass house with two rooms in 1911. They added a cow house but no longer had a barn. Martin (60) and Maggie (called Margaret in 1901) (55) Higgins lived in house 45 (same numbered house as in 1901) with their seven children; Pat (called Patrick in 1901) (20), Kate (16), Ellen (14), John (13), Michael (11), Sabina (9) and Maggie (5). There was no mention of Peter or Mary in this 1911 census. Martin and Maggie (Snr.) were married 23 years, had nine children and eight of them had survived until 1911. Martin was a farmer. John, Michael, Sabina and Maggie (Jnr.) were scholars. The parents could not read or write. Maggie could read only and the rest of the household could read and write. Martin, Maggie (Snr. ), Pat, Kate and Ellen spoke Irish and English, the rest of the household spoke Irish only. Ellen was listed in this 1911 census as ‘Idiot’. They lived in a 3rd class house with 2 rooms in 1911; they did live 2nd class with 3 rooms in 1901. They had a cow house. Pat (called Patrick in 1901) Higgins (63) lived in house 46 (previously numbered house 46) with their five children; Kate (called Catherine in 1901) (18), Michael (14), Sabina (16), Nora (called Honor in 1901) (13) and Maggie (called Margaret in 1901) (11). There was no mention of Mary, Martin, Bridget or Ellen in this 1911 census. Pat was a widower and did not give details of his previous marriage. Pat was a farmer. Michael, Nora and Maggie were scholars. Pat could not read or write but his children could. Everyone in this household spoke Irish and English. They still lived in a 3rd class house with 2 rooms. They had a cow house. John Kerrigan (81) lived in house 47 (previously numbered house 52 in 1901) with his son, John (32), and daughter in law, Kate Kerrigan (29). There was no mention of Catherine or Thomas in this 1911 census. John (Snr.) was a widower and does not give details of his previous marriage. John (Jnr.) and Kate was married for one month and had no children. John (Snr.) was a farmer. No one in this household could read or write. John (Snr.) spoke Irish only and his children spoke Irish and English. They still lived in a 3rd class house with two rooms. They had a cow house. Michael (69) and Mary (66) Mullroe resided in house 43 (previously numbered house 47 in 1901) with their four children; Martin (22), Annie (called Anne in 1901) (18), Bridget (16) and Ellin (called Ellen in 1901) (12). There was no mention of Mary, Patrick or James in this 1911 census. Michael and Mary was married for 30 years, had thirteen children and ten of them had survived until 1911. Michael was a farmer. Michael could not read or write but his children could. Everyone in this household spoke Irish and English. They still lived in a 2nd class house with 3 rooms. They had a stable, a cow house, a calf house and a barn. Anthony Saunders (87) lived in house 49 (previously numbered house 55) with his son, daughter-in-law and his five grandchildren. His son was John (49), his daughter-in-law was Bridget Saunders (50) and his grandchildren were John (15), Michael (12), Martin (13), Anthony (5) and Bridget (3). There was no mention of Thomas or Mary in this 1911 census. Anthony (Snr.) was a widower and did not give details of his previous marriage. John (Snr.) and Bridget (Snr.) were married for 20 years, had seven children and seven of them had survived until 1911. Anthony (Snr.) was a farmer. Michael, Martin and Anthony (Jnr.) were scholars. The grandparents and Bridget (Jnr.) could not read or write. Michael, Bridget (Snr.) and Anthony (Jnr.) could read only. The rest of the household could read and write. Bridget (Snr.) spoke Irish and English, the rest of the household spoke Irish only. It is not stated on the census form where Bridget (Jnr.) was born. They lived in a 2nd class house with 3 rooms in 1911, in 1901 they lived in a 3rd class house with two rooms. They had a stable and a cow house. Pat (called Patrick in 1901) (60) and Bridget (59) Burke lived in house numbered 50 (previously numbered 53 in 1901) with their five children Pat (called Patrick in 1901) (20), Mary (18), Michael (17), Julia (14) and Kate (13). There was no mention of Bridget in this census. Pat (Snr.) and Bridget had been married for 24 years, had six children and all six of them had survived by 1911. Pat (Snr.) was a farmer. Julia and Kate were scholars. The parents could not read or write while their children could. Pat (Snr. ), Kate and Julia spoke Irish only. The rest of the household spoke Irish and English. They still lived in a 3rd class house with two rooms. They had a cow house. Bridget Casey (60) resided in house numbered 51 (previously numbered 49) with her two children; Pat (called Patrick in 1901) (24) and Mary (15). There was no mention of Patrick, Michael, Peter or William in this 1911 census. Bridget was a widow and did not give details of her previous marriage. The census form for 1911 was not filled in properly as under the ‘rank, profession and occupation’ row they stated ‘Roman Catholic’. No one in this household could read or write and they all spoke Irish. They still lived in a 3rd class house with two rooms. They had a cow house and a calf house. Martin (47) and Margaret (48) Carney resided in house numbered 52 (previously numbered 50 in 1901) with her two children; Michael (20) and Bridget (15). There was no mention of Mary or Bridget in this 1911 census. Martin and Margaret were married for 23 years, had three children and all three of them had survived until 1911. Martin was a farmer. No one in this household could read or write. Martin, Margaret and Michael spoke Irish only and Bridget spoke Irish and English. They still lived in a 3rd class house with 2 rooms. They had a cow house. Nor a (called Honor in 1901) Herwood (94) lived in house numbered 54 (previously numbered 31). There was no mention of Michael in this census. Nora was a widow and did not give details of her previous marriage. Nora was listed as a ‘old age pensioner’. Nora could not read or write and spoke Irish only. Nora was born in Mayo. She lived in a 3rd class house with one room. She had no out offices or farm steadings in 1911 or 1901. Her landlord was Sabina Joyce who also lived in Cloghbrack Upper in house numbered 25. In the 1901 census the head of households of 43 and 56 are actually mother Mary Kerrigan and her daughter Bridget Kerrigan respectively. It seems Bridget lived with her two siblings Margaret and Thomas separate from the rest of the family in household 56. By 1911 Mary Kerrigan’s house is now 44. Kate is missing in 1911 since she immigrated to Pittsburgh, PA. Margaret Kerrigan is missing since she immigrated to Johnstown, PA. By this time Bridget Kerrigan had married and is now Bridget Joyce living with her four oldest children in house 53. So I believe household 53 was formerly household 56 in 1901. Her husband of 6 years was Thomas Joyce originally from Kilbride, Owenbrin, Mayo. I believe he was not listed on the census since he would travel to the USA for work every few years. I have all of this information to share because Bridget Kerrigan Joyce is my grandmother and Mary Kerrigan is my great-grandmother. Bridget Joyce had a new home built on the same plot of land in 1930 and died there in 1955.